The Parkland Products New Zealand SpeedGolf Open is just around the corner and we have every format for every player waiting for you. We have added a more social element to the mix with the opportunity from sports teams or businesses to get a team together and go head to head in a four-hole fun challenge once play finishes. In teams of four, everyone plays one hole as fast as they can before tagging their teammate on the next tee. ENTRY IS FREE and numbers are limited - Saturday February 2, be there! The following Sunday, there is a chance to all beginners to try out SpeedGolf and experience the feel of quality golf shots when playing instinctively. Come join us for nine holes from 7am. This will only take approximately 30 minutes, which is a pretty quick and easy way to beat your mate again! Stay for a swim and BBQ with a refreshing drink while watching those entered in the main competition finish up. For all of the above, please email philaickin@nzgolf.org.nz to register and be part of something new and something that is growing at a rate of knots! 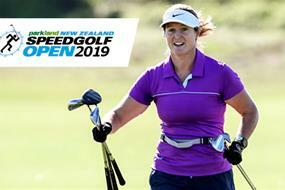 Entries have opened for the 5th edition of the PARKLAND New Zealand Speedgolf Open. Whitford Park in Auckland host the championship 2-3 February. The course has couch fairways which are superb to run on and has gentle undulations to make the run an interesting challenge. From the clubhouse spectators will be able to view half of the holes and monitor competitor progress, whilst the 18th hole finishes in an amphitheatre setting. Conditions will be hot and muggy and Whitford Park have a swimming pool to cool off in. The entry fee is $115. Players receive a tournament shirt, practice round and two tournament rounds of golf. Additional prizes may be added based on entries, particularly in the women's division.